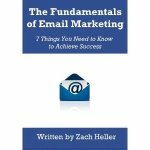 Marketers have been using email as a way to communicate with customers and prospective customers for many years now. As a marketing channel, email has consistently had the highest return on investment. That’s partly because email is so cheap that it’s practically free. And because email works so well, it has often been the case that we, as marketers, come back to it again and again. Adding a new email to our existing campaigns is cheap and easy. And so we do, often without asking ourselves if it’s too much. But at a certain point, logic would suggest, it is too much. We are emailing people too often, and driving them crazy in the process. When a company emails you too often as a consumer, you are turned off. When that happens, marketers risk sowing ill-will among their subscriber base and potentially losing customers in the process. It should be obvious, but we want to avoid that. But how? How do we know when we are emailing too often? Where is the line between not emailing enough, and emailing too much? The answer is simple: we test. Why wouldn’t we test frequency? When we test our emails, we are measuring which versions deliver better results. In a subject line test, we are measuring open rates. The subject line with the highest open rate wins. In a content test, we are measuring click-through rates. Whichever design gets more people to click through to the website wins. In a frequency test, we have to measure several metrics at once. First, we have to measure opt-outs and complaints. These are the best metrics email marketers have to measure how many people are turned off by emails. When someone takes action to unsubscribe or mark an email as spam, they are signaling to the company that this email crossed the line in some way. But that’s not all we have to measure, because opt-outs and complaints rising do not, be themselves, tell us if our strategy is working. For that, we also have to measure conversions. A conversion might be a sale, or a donation, or a click through to an article – whatever you want your recipient to do. This is the ultimate success metric. If opt-outs and complaints go up, but conversions also go up, your frequency test is still a winner. Because the new frequency is leading to a higher ROI, even if it’s turning some people off. If opt-outs and complaints go up, and conversions stay flat or drop, your frequency test is a loser. Adding more emails did not lead to any measurable improvement in business outcomes. And you should go back to the old email strategy. It’s that simple. Now that you know how to test whether you are emailing enough, start emailing more. There seems to be a tendency with many companies these days to settle on one email design and use it for every email that they send out. The reasoning makes sense. If you find a template that works for you, why not use it as much as possible? It’s easier for your design team to only do the job once. It’s easier for your email team not to seek design and coding resources every time you want to send out a new email. But marketers must weigh the convenience that this approach offers with the very real impact it can have on your goals and objectives. Every email that we send out has a purpose. If it didn’t, we should not send it. The purpose of your monthly newsletter might be to keep people engaged, and add value for your customers. The purpose of your prospecting emails might be to generate quality leads for your sales team to follow up with. The purpose of your promotional emails is likely to generate direct sales. Because the purpose of each of these emails is different, it stands to reason that the design you use should be different. Here is a link to a nice promotional email from The Athletic. In it, they are offering a 50% discount on their basic subscription plan. The email works because it is simple, calling attention to the offer with bold text and a button that stands out. They don’t need to clutter it up with a bunch of content or imagery. It gets straight to the point. Now compare that with this email from Apple News. This is a more traditional newsletter, offering a curated list of articles that a subscriber might find interesting. This email is laid out nicely, offering readers the chance to scroll through and click on any of the articles they want to read more of. Both email are good, though they look nothing alike. And that’s because they were designed to do different things. When designing your emails, don’t reach for the same template you have been using forever. Instead, start by identifying the purpose of the email. What is your goal? Then take that to the design team and have them help you create something that achieves that goal for you. For as long as there has been email, there have been people predicting its downfall. I can’t tell you why. Perhaps the early naysayers had a bad experience trying to make the jump to near-instant communication with their coworkers. Others may have jumped on the bandwagon after marketers got their hands on email and turned into a non-stop promotion machine. Invasive spammers certainly caused their issues but the email service providers have essentially eliminated that from our experience with email these days. Every new technology since email has at one time or another been described as an email killer. None of those predictions is worth very much today. That said, in a world with more ways to connect with people than ever before, companies should always question whether their preferred channels of communication with customers are still the right ones. Companies have been using some form of text messaging for marketing for the last decade. For people who found the intrusion of brands into their inbox, SMS was probably not the solution they envisioned. Nowhere is a promotional message more intrusive than on your phone, right? But many consumers actually prefer the convenience the channel offers to email. In many ways, it’s more immediate, and more intimate. With brands you already have some connection to, an SMS can inspire action in ways an email won’t. It’s most commonly used as a way to communicate with existing customers about special promotions or location-based offers. Mobile apps opened up a whole new channel of communication that companies have been excited about for some time. Push notifications from apps come in the form of banners on the lock screen, drop down alerts on the home screen, and red dots above app icons. They are announcements to the user that there is some action they need to take. Push notifications were designed as a way for apps to communicate with its’ users when they were not in the middle of using the app. Rather than send an email or a text message, they can use the phone’s notification system to “send a message”. Companies use these as a subtle nudge to get customers to engage with their apps more frequently than they otherwise would. Is There Still Room for Email? As you may have guessed from the introduction to this article, there is and always will be room for email. SMS and push notifications are good ways for brands to communicate with customers. But they supplement email, at best. They will never replace. Email continues to be the marketing channel with the highest return on investments. No one is predicting that SMS or push notifications will take that honor anytime soon. Subject line testing is a crucial part of any email marketer’s role. It is singularly one of the simplest and most effective ways to improve the performance of an email marketing campaign. But saying it is simple is one thing. So today I wanted to actually take the time to lay out the do’s and don’ts of subject line testing so that every brand, organization and marketing team can succeed in their quest to find better subject lines. Essentially, subject line testing is the process by which you seek to improve the open rate on your emails by delivering the same email to different audiences – one of which sees one subject line, and the second group sees the other. In this way, subject line testing is a very specific example of an A/B Test. The reason that brands of all types run subject line tests is that it is one of the best ways to improve the overall performance of an email marketing campaign. Because the subject line is one of the first considerations for an email recipient – one of the first things they see along with the sender once an email lands in their inbox – it is one of the most important elements of any email. Often, a subject line alone will mean the difference between a recipient choosing to open the email or not. So by testing multiple subject lines, we aim to improve the open rates over time. You can test the entire list. If you are testing an entire list, you simply send 50% of them subject line A and the other 50% subject line B. These results will help you plan for future emails. You can test just part of a list. You might choose to only test part of the list, so that you can use the results of the test to send the winning subject line to the rest of the names on the list. For example, you might take 20% of your list and split it into two groups (10% each) for the test. Then wait 24 hours to determine the winner before sending the remaining 80%. You can test programmatic emails. If you have an automated email campaign, one that triggers based on user actions and often includes more than one email in a sequence, you can build tests into your program. Send half of your users down one path and half down another, and run subject line tests at each step in the process. However, here you must remember that the sequence matters, meaning the results of one test at the beginning could impact results of emails that come later. Judging the results of a subject line test should be quite easy. Remember from the information above that the goal of any subject line test is to improve the open rate of that email. And so it is the open rate that we must measure. Compare the open rate of subject line A against the open rate of subject line B, and you should get your answer. The email with the higher open rate is the winner. Allow enough time between the email send and the results analysis. Not everyone will open the email right away. A good rule of thumb is to wait at least 24 hours to declare a winner. Statistical significance matters in any A/B test. A result is considered statistically significant if the confidence level is at least 90-95%, meaning you can confidently conclude that the subject line was responsible for the difference in open rates (rather than chance). This is a great free tool to measure statistical significance. It can be tempting to look at metrics other than the open rate, such as the click through rate. But the subject line will have less impact there. If the open rate on one version is significantly higher, but the click through rate on that version is significantly lower, you might consider what other factors are leading to those results. As a general rule, you should test all of your subject lines. There is no surefire way to know which subject lines will perform best for an individual email. And testing is the only way to determine that with any certainty. But just like anything else that you do, some measure of priority must be determined. Which emails are the most important? How would an improvement in the open rate of each email impact the business at large? You can check out this tool from SubjectLine.com, which calculates a score based on a very specific formula for subject line effectiveness. But remember that that is just a guide and just because a subject line does not score well doesn’t mean that it won’t perform well with your lists.